Springsteen says Clinton is a 'clear choice' Jump to media player Bruce Springsteen says "the choice couldn't be clearer" a rally in Philadelphia in support of Hillary Clinton. Ladies first: How US politics got left behind Jump to media player On Tuesday the US may elect its first female leader. Dozens of other countries got there first. Is this the nastiest US election campaign? Jump to media player The BBC looks at the low blows traded in the presidential campaign. With just a few hours remaining of the US presidential election campaign, Donald Trump and Hillary Clinton are holding their final rallies. 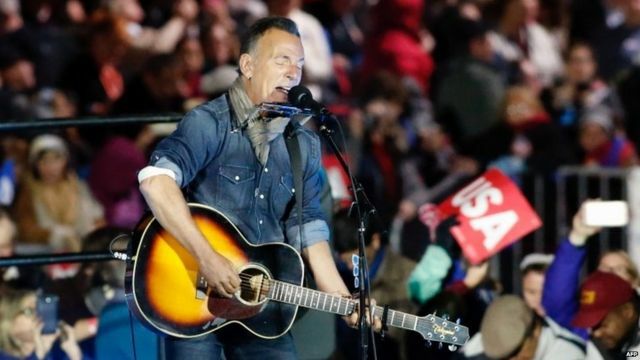 Bruce Springsteen has been performing at a rally in Philadelphia in support of Hillary Clinton. He told the crowds that Mrs Clinton was the obvious choice for US president.